…an enchanting outdoor art installation, created as part of Eden Arts’ CANOPY project. 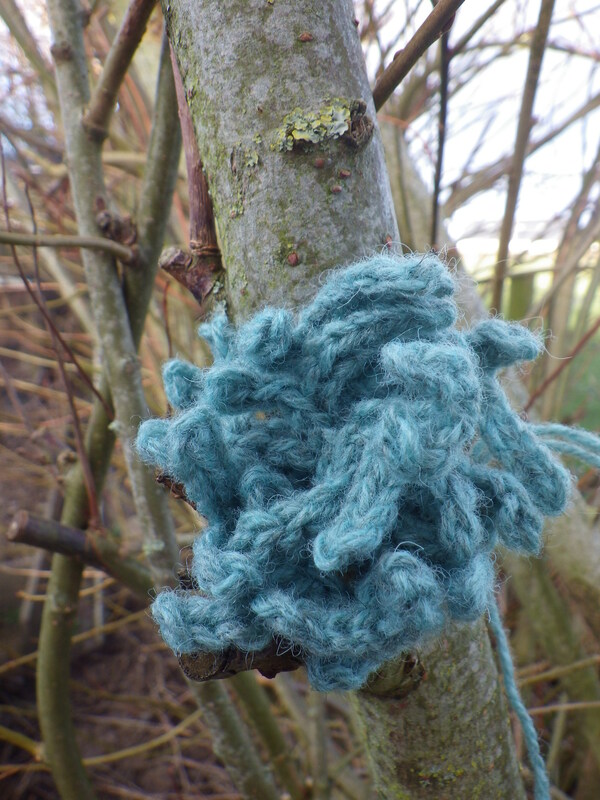 The exhibit features hundreds of woodland themed woollen artworks; all made using 100% wool, in support of ‘The Campaign for Wool’… After the success of the first exhibition we are now inviting people to make artworks for a 2014 Woollen Woods installation at National Trust property Sizergh. Last Saturday, whilst needing something to occupy my over-active brain at 2:30 in the morning, I decided to make my contribution. The result was a group of three Boletus fungi. And so on Sunday I downloaded the submission form so that I could send them off. Alas – they are not eligible! All the pieces of work have to be mounted in the trees rather than on the ground, and I have made a species that definitely occupies the woodland floor. So, those fungi will have to have a different home. Obviously 2:30am is not the best time to make decisions! I still want to contribute something to the project, so last night I did a bit of free-form crochet and created this lichen (it’s supposed to be Ramalina fraxinea). Next I’m planning to make some Graphis scripta (a white lichen with what looks like black writing on it) before moving on to bracket fungi, which really do grow on trees. Amusingly, the word ‘crochet’ in French means ‘square bracket’ so there is something strangely pleasing to me about making crochet bracket fungus! Thank you… they are currently residing on a bookshelf, but I wonder whether to do a bit of natural yarnstorming! Your fungi look fantastic! I was thinking about making a toadstool pincushion, I think it could look quite cute. I’m currently using a crochet cup cake as a pin cushion, but I like the idea of a toadstool pin cushion! Pintrest is on my list to get to grips with… I’d just much rather be hooking!!! Checking out how to do it now… done I think… let me know if it works! Very nice and colourful fungi. What a shame they couldn’t be entered. I agree about Pinterest. A good place to display your work but also a great place to post your blog to for others with a similar interest to link to you. Not that you’re restricted to subject at all. The little mushrooms are so cute! And I love the lichen as well. Just lovely. It’s certainly helping to reduce the stash! The Ramalina fraxinea picture isn’t showing, just the caption. But your boletus are bootiful, exceptionally cute. 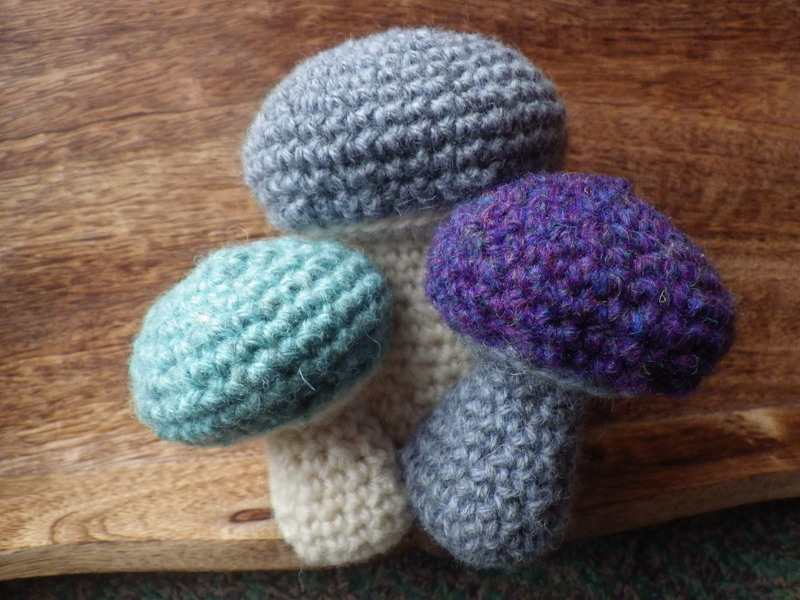 Don’t see a Pinterest button yet, though… Perhaps a whole series of spectacular crochet fungus? Pictures seem to be unreliable at the moment on several WordPress blogs. The Pin-it button, should be in the side bar now, but I will get Mr Soh to check it out from his blog tomorrow… clearly just because I can see it, doesn’t mean you can! I’ve done a refresh, too. Both now there! Thank you. That bracket fungus is wonderful!